Mix together flour, sugar, salt, and instant yeast. Mix in shortening. Mix in water. Turn out onto a lightly floured surface. Knead by hand for 20 minutes. Cover dough with oil. Place dough in a bowl, cover, and proof for 1 hour. 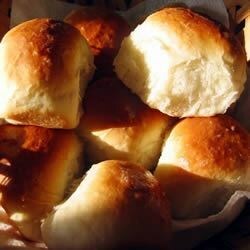 Form rolls, and place on a greased baking tray. Proof for 45 minutes. Bake at 400 degrees F (205 degrees C) for 12 to 14 minutes. Oh, this is really good. Made it once with wholewheat flour and it was still very light and tasty. If you use veggie oil instead of butter - this becomes a vegan recipe. really good and easy. even the kids helped make the rolls. I used a breadmaker for the kneading part.